This individual Report Smart Cards and Healthcare is available for purchase. This Report is available to members of Mercator Advisory Group’s Emerging Technologies Advisory Service. Please be advised that this Report is normally part of a research and advisory service that provides ongoing support throughout the year. As such, this Report contains significant depth of content that is selected for its strategic importance to our members. (For a description of these services, see our Advisory Services section). Smart card shipment volumes continue to rise year over year and adoption for the mobile sector, contactless payment applications, and government ID segments remains strong. 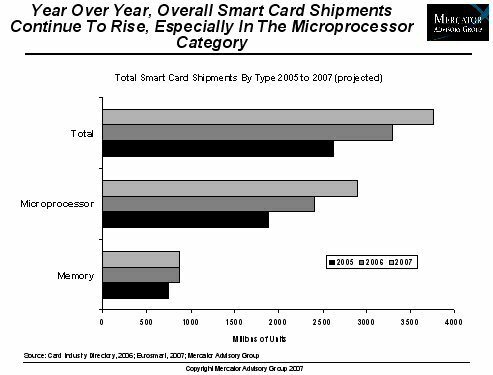 Meanwhile, multi-applications smart cards in healthcare remain a small but growing portion of the overall microprocessor card market. While some may dismiss the strength of smart card applications for healthcare, there are compelling benefits to their use. In the United States, the ability to enhance HIPAA compliance, combined with strong capabilities to limit healthcare fraud, are among the benefits offered by smart cards. In addition, the ability to streamline claims processing while simultaneously delivering important medical information in a timely manner, especially in emergency situations, make a strong case for healthcare smart cards. "In the United States, as we see interest in consumer directed health plans grow, patients must become more involved in the healthcare process," states Melanie Broad, a member of Mercator Advisory Group's Emerging Technologies Service and principal analyst on the report. "Considering the number of players in the space, smart cards could transfer information amongst the various members of the healthcare space with relative ease, helping all players manage the healthcare process from registration to payment." In Smart Cards and Healthcare: An Opportunity For Payments, Mercator Advisory Group examines various examples of healthcare smart card programs in France and Germany. In addition, a US-based pilot that involved two-factor patient authentication is reviewed as well as a current initiative to bring smart cards to healthcare in order to create a regional medical network. The report also discusses smart card manufacturers who are currently engaged in the healthcare market. A discussion of the opportunity for smart cards to impact payments in the healthcare space, and landscape populated by a multitude of players, concludes the report. The report contains 26 pages and 5 exhibits.